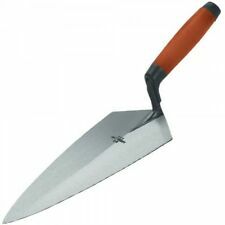 Marshalltown 33-11 London Pattern Brick Trowel Durasoft Handle 11"
The blades are expertly ground from heel to toe and are London Pattern with a wooden or Durasoft® handle and polished steel ferrule. The impact area is strong to provide extra endurance, the flexibility produces the unique feel of Marshalltown brick trowels. SOLID FORGED HIGH QUALITY CARBON STEEL BLADE WITH DURASOFT COMFORT GRIP. 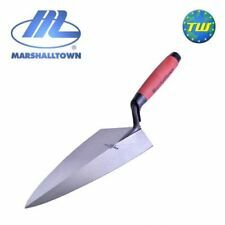 MARSHALLTOWN 3412 12" BRICK TROWEL LONDON PATTERN. SOLID FORGED HIGH QUALITY CARBON STEEL BLADE WITH DURASOFT COMFORT GRIP. 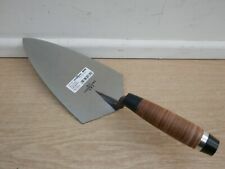 MARSHALLTOWN 34D 11" BRICK TROWEL WIDE LONDON PATTERN. 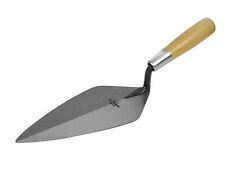 MARSHALLTOWN 19L 11" BRICK TROWEL PHILADELPHIA PATTERN WITH LEATHER HANDLE. Marshalltown Philadelphia Pattern Brick Trowel; forged from a single piece of high carbon steel and heat treated for strength. 10in Brick Trowel. Made in the USA. The impact area is strong to provide extra endurance, the flexibility produces the unique feel ofMarshalltown brick trowels. 11in Brick Trowel. Made in the USA. The impact area is strong to provide extra endurance, the flexibility produces the unique feel ofMarshalltown brick trowels. SOLID FORGED HIGH QUALITY CARBON STEEL BLADE WITH DURASOFT COMFORT GRIP. MARSHALLTOWN 19D 10" BRICK TROWEL PHILADELPHIA PATTERN. 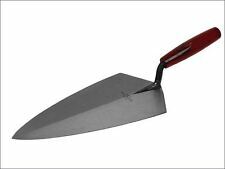 Marshalltown Brick Trowels are manufactured from a single piece of high grade tool steel. -The impact area is strong to provide extra endurance, the flexibility produces the distinct feel of Marshalltown brick trowels. Each Marshalltown Brick Trowel is forged from a single piece of high carbon steel, and heat treated for unmatched strength and durability. High strength and consistent flexibility of the blade is maintained as it is taper ground and polished. SOLID FORGED HIGH QUALITY CARBON STEEL BLADE WITH DURASOFT COMFORT GRIP. 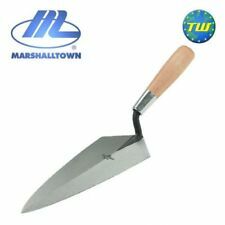 MARSHALLTOWN 19D 12" BRICK TROWEL PHILADELPHIA PATTERN. 1 x Stabila Ribbed 24" (600mm) STB96-2 Brick layer level. 12Pc Tools set. 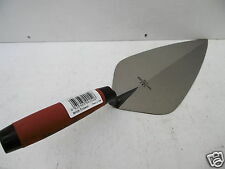 1x Heavy Duty Bucket Trowel 7". 1 x 22 pocket Contractors Tools Bag. 2 x 50m Line set. 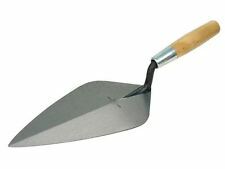 MARSHALLTOWN 45D 6" POINTING TROWEL PHILADELPHIA PATTERN. SOLID FORGED HIGH QUALITY CARBON STEEL BLADE WITH DURASOFT COMFORT GRIP. 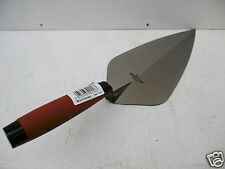 MARSHALLTOWN 19D 12" BRICK TROWEL PHILADELPHIA PATTERN. SOLID FORGED HIGH QUALITY CARBON STEEL BLADE WITH DURASOFT COMFORT GRIP. MARSHALLTOWN 19D 11" BRICK TROWEL PHILADELPHIA PATTERN. 10121 Model Code: AC - Price is for 1 Each (part# 10121) This item features: -Forged from a single piece of high carbon steel, then heat treated for strength and durability. -Blade is taper ground and polished to give it the correct flexibility for the proper "feel". The handle is securely attached with a polished steel ferrule, straight shouldered Philadelphia pattern blade. Marshalltown Brick Trowels are manufactured from a single piece of high grade tool steel and the blades are expertly ground from heel to toe. 5 out of 5 stars - Marshalltown London Brick Trowel Durasoft Handle 10 "
1 product rating1 product ratings - Marshalltown London Brick Trowel Durasoft Handle 10 "
The Marshalltown M48D gauging trowel solid forged from high grade tool steel and carefully taper ground and polished. Part Number : M1912D. DuraSoft handle. Handle rise is set for correct hang and balance. Impact area is extra strong.